David Liebrader is an experienced investment loss recovery attorney. His practice is dedicated to helping victims of investment fraud recover their investment losses. For over twenty years he has been lead counsel on over 1000 cases, representing individuals, firms, pension plans and trusts that have lost money. He has secured judgments, awards and settlements in excess of forty million dollars on behalf of his clients. David has extensive trial experience representing investors in court and arbitration, and has experience with a wide range of FINRA and SEC related proceedings. 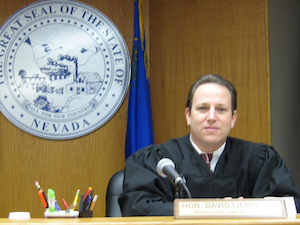 David is active as a pro temp judge for the Clark County, Nevada District Court, serving several times a year. He also serves as an arbitrator for FINRA Dispute Resolution (Chairman qualified.) He is a member of the Nevada State Bar’s attorney discipline committee, and serves as a fee dispute mediator and arbitrator for the Nevada State Bar, where he resolves attorney-client fee disputes. David’s successes on behalf of his clients have been written about in The Las Vegas Review Journal, The Las Vegas Sun, Kiplinger’s Magazine and Research Magazine and profiled on CNN. Dave has lectured extensively on recovering and preventing investment losses. David is on the faculty at Columbia College. He is a graduate of UCLA and California Western School of Law. He is licensed to practice law in California and Nevada, before The United States Supreme Court, and in federal courts in Nevada, Colorado and California. David has associated himself with experienced practitioners and experts around the country, and is able to provide prompt case evaluation through a free, confidential consultation. Before undertaking investment arbitration or litigation it is important that you hire a securities lawyer with a keen understanding of the state and federal laws that apply to this highly specialized field. When it comes to investment fraud, there is no substitute for a litigator with experience, and David Liebrader is a qualified attorney who will aggressively fight to recoup your investment losses from unscrupulous brokers, financial planners, and Ponzi scheme con artists. David’s successes have been covered in the Las Vegas Review Journal, the Las Vegas Sun, Kiplinger’s Magazine, and Research Magazine. He has also been profiled on CNN as a highly qualified securities attorney.